See Most Popular "Guest Stars"
See more Interview Guest Experts here. Check out our "Guest Stars" here. List YOUR Guest Expert Profile in our directory here. Click to Find the Experts & Authors you want to Interview here. 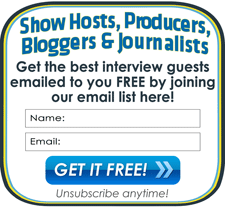 Producers & Reporters get new Interview Guest listings by email for easy interview bookings! Get Free "Guests Available" Emails!